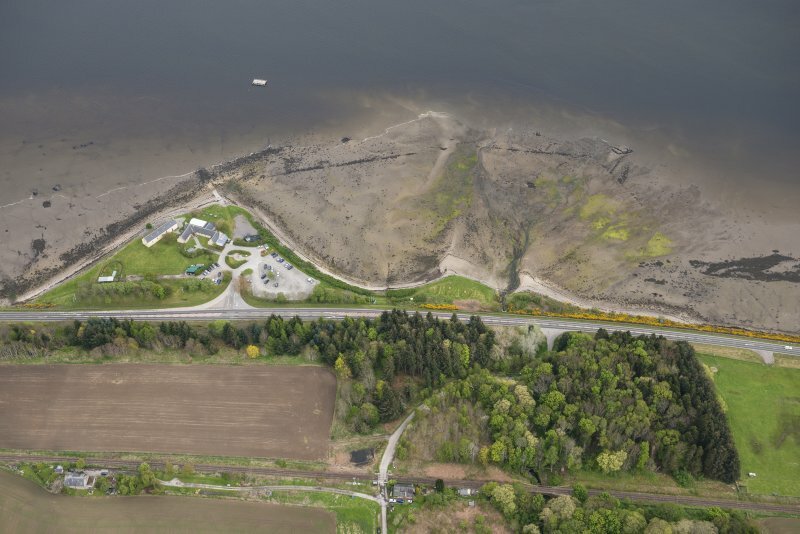 Oblique aerial view of the fish traps at Foulis Ferry, looking SE. 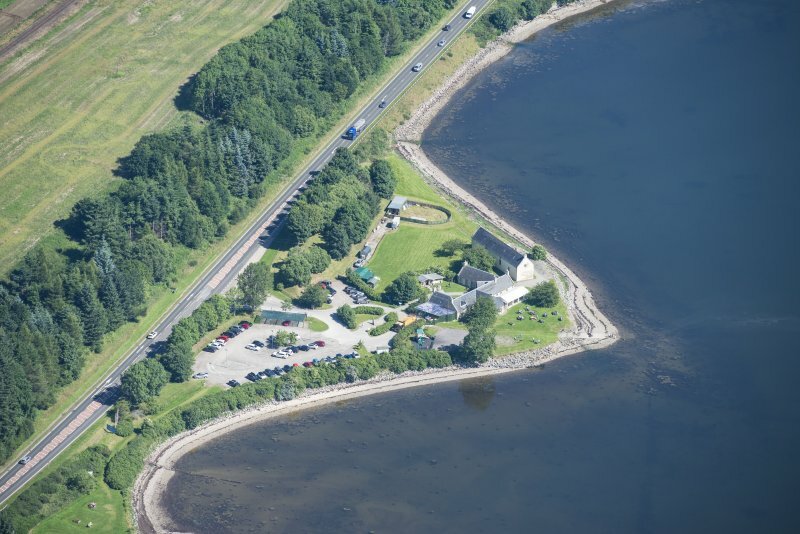 Oblique aerial view of Foulis Point, looking SSW. (Location cited as NH 599 636). 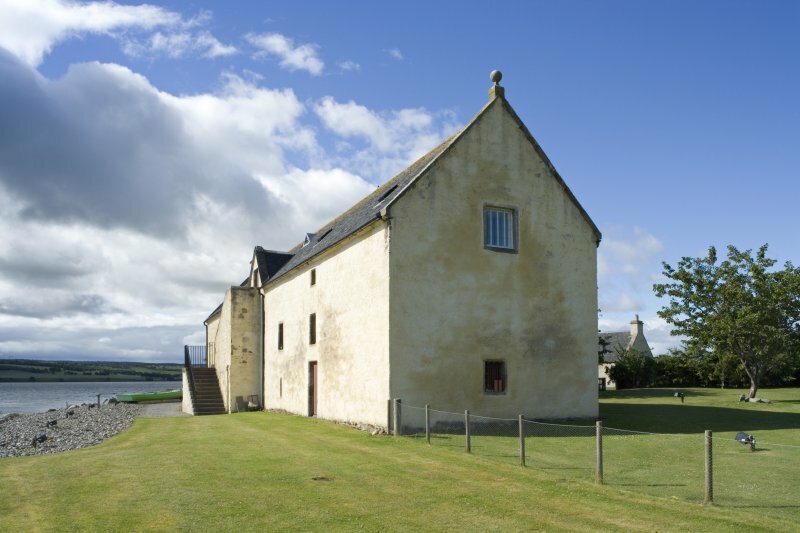 Granary, Foulis Point, 18th century. 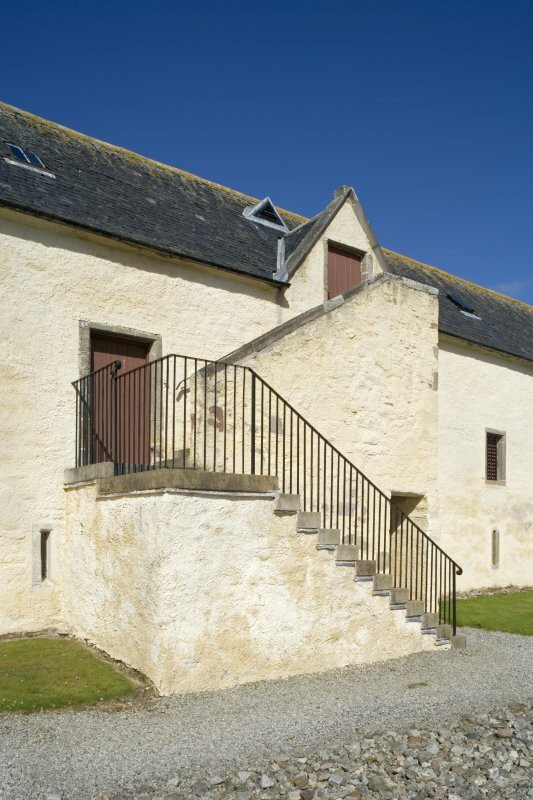 A large three-storey, six-bay harled building with an external open stair giving access to the upper floor. 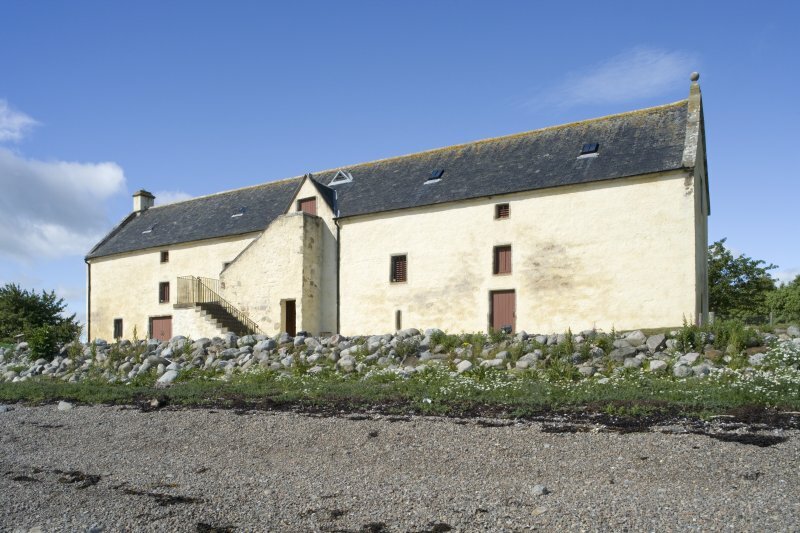 Nearby is a block of single-storey cottages, and on the beach in front of the granary are the decaying keels [frames] of at least four wooden vessels. Termed 'Old Rent House' and said to have been used to store estate rents, paid in kind, for shipment. J G Dunbar 1966; J R Hume 1977. 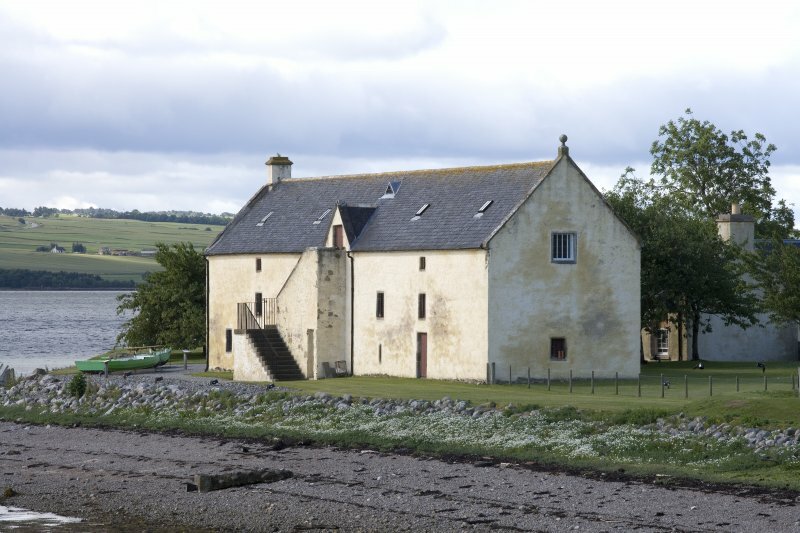 A disused 18th century granary or Rent House. Three stories harled, with an external open stair giving access to the upper floors. 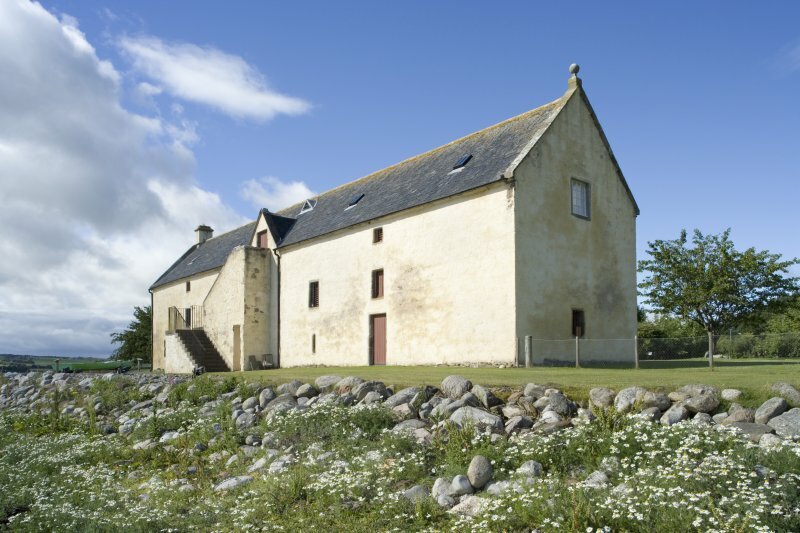 Built around 1740 as an estate storehouse, or girnel, for the Munros of Foulis. Around this time, rents were mostly paid in kind, as were a proportion of estate workers wages. 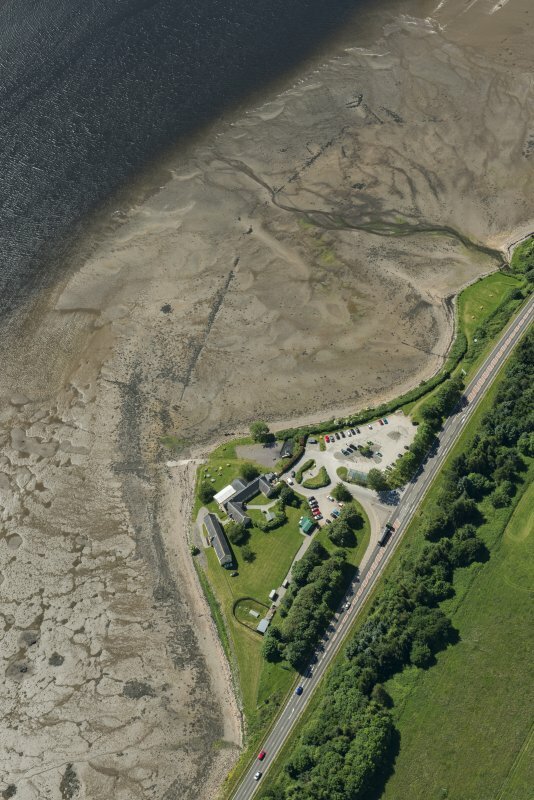 Oats and barley would have been stored here, and thence shipped out to Fort George where they would be sold to the army, or to Inverness. 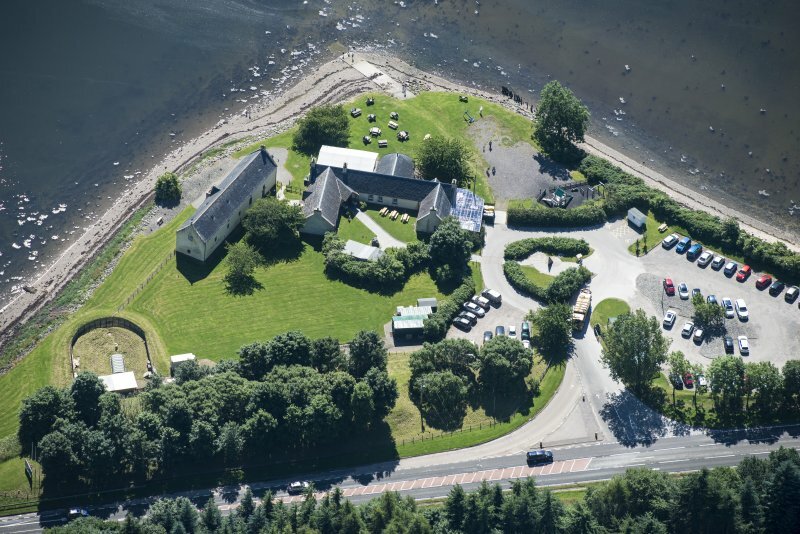 The Rent House was the scene of a riot in 1796, when the townspeople of Dingwall marched on it at a time of food shortage in order to prevent the export of grain they believed to be held there. The crowd eventually dispersed without serious incident. 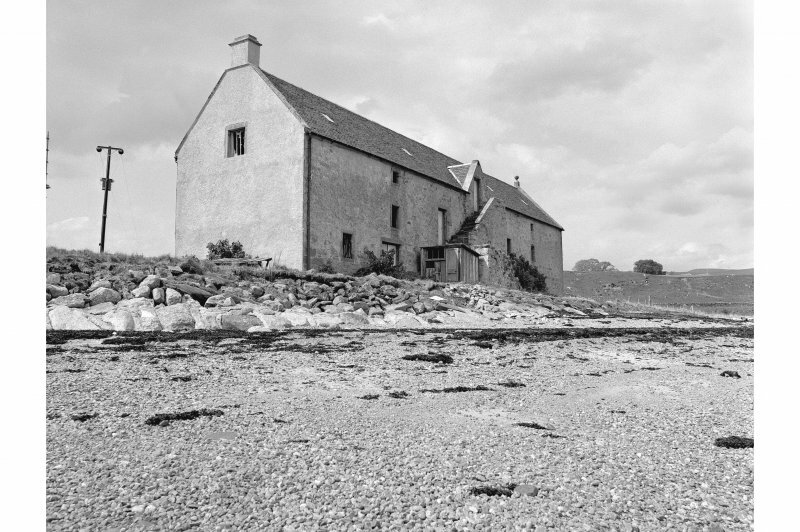 The Rent House remained in use as a storehouse for goods moving in or out of the estate by sea well into the 20th century. 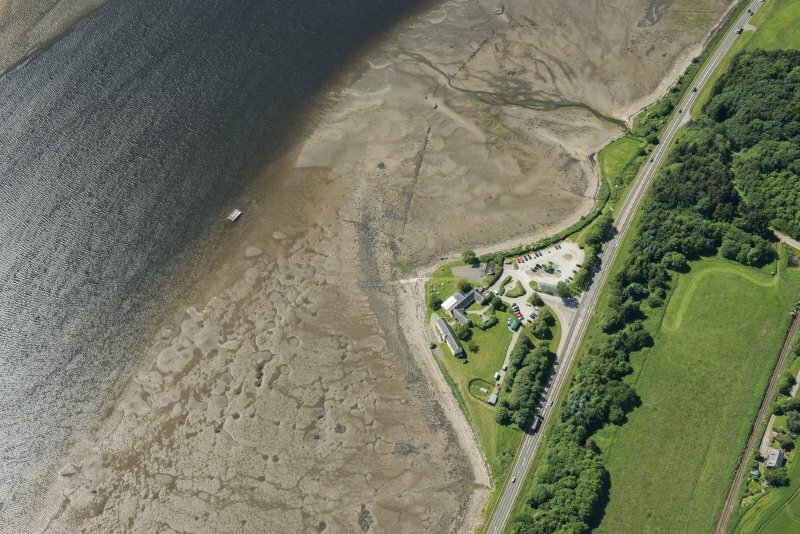 Though it stands just outwith the Cromarty Firth SSSI, Foulis Point Rent House is of importance to the history of this part of the Cromarty Firth: also it is likely that some associated structures (such as boat moorings) may well lie along the shore, and within the SSSI. J Wordsworth, SSSIs, Scottish Natural Heritage, 1993. 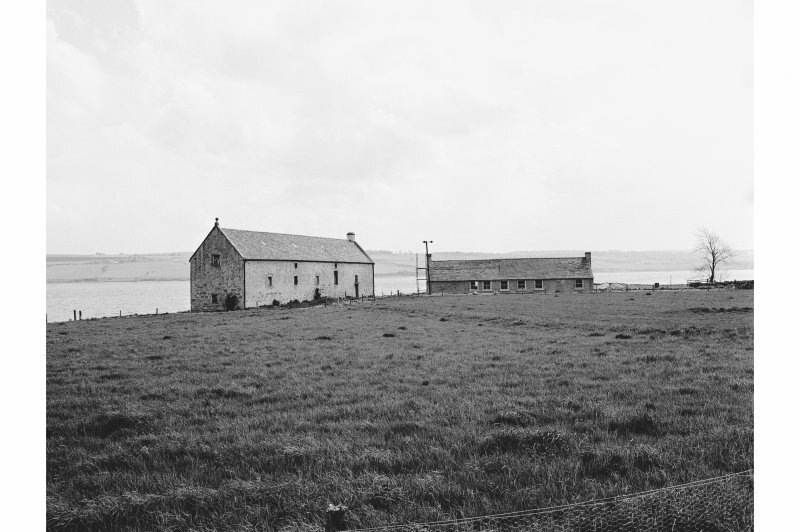 Granary / storehouse / girnal; roofed on the 1st edition OS 6-inch map (Ross and Cromarty, sheet lxxvii; 1880) - stable condition. 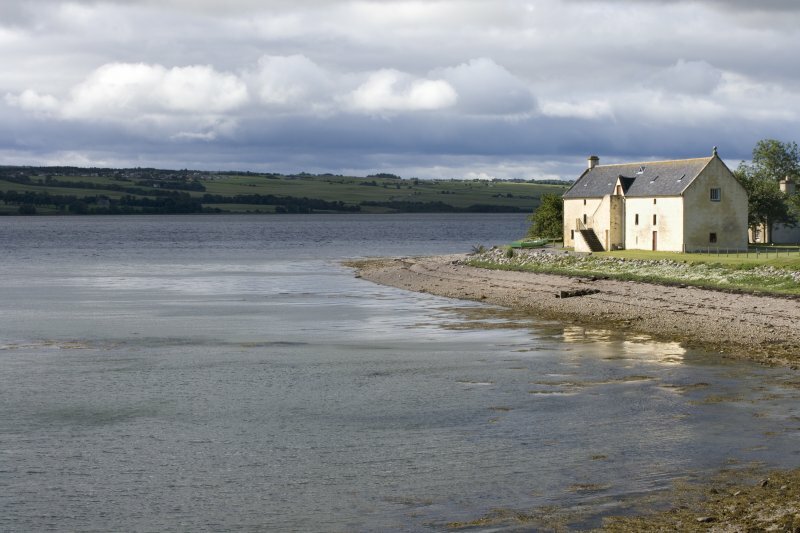 The Old Rent House at Foulis Ferry Point stands on the shore of the Cromarty Firth just above the hightide line, where boats could beach on the shingle. 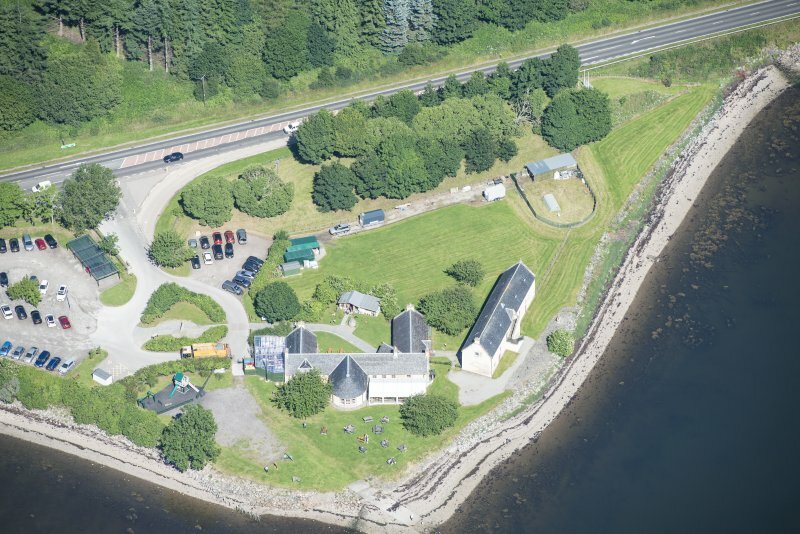 It was built around 1740 as an estate storehouse orgirnal for the Munros of Foulis, at a time when rents were largely paid in kind. 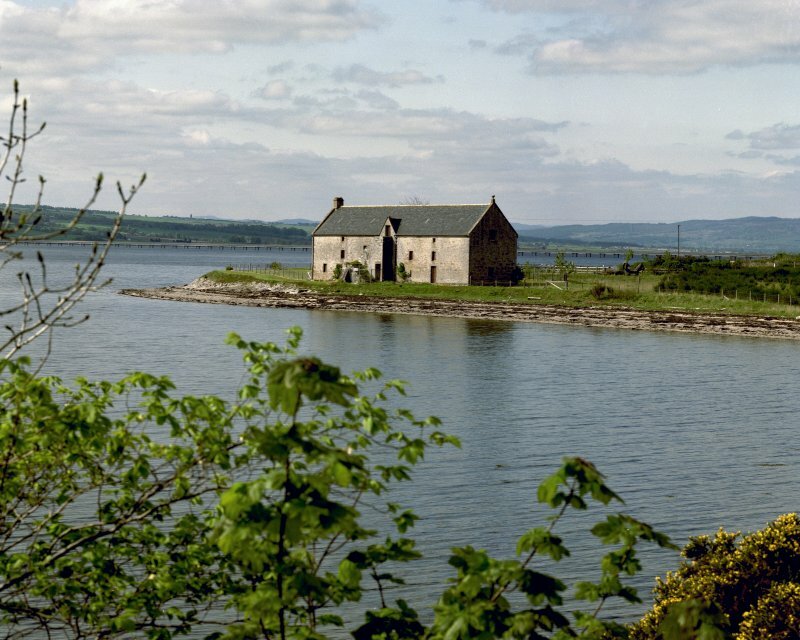 Oats and barley were stored here, and some portioned out to farm servants as part of their wages; the rest went off by ship to be sold to the army at Fort George (no. 41), or in the markets at Inverness or further south. Various accounts survive relating to the Rent House; one is a 'Note of Barley and Oat Meal given into the Store House of Fowlis' in 1795, which also lists issues of meal or barley to various folk including widows, the schoolmaster, and the Minister who got 38 boils (a boil of barley weighed around 160-170 Ibs). 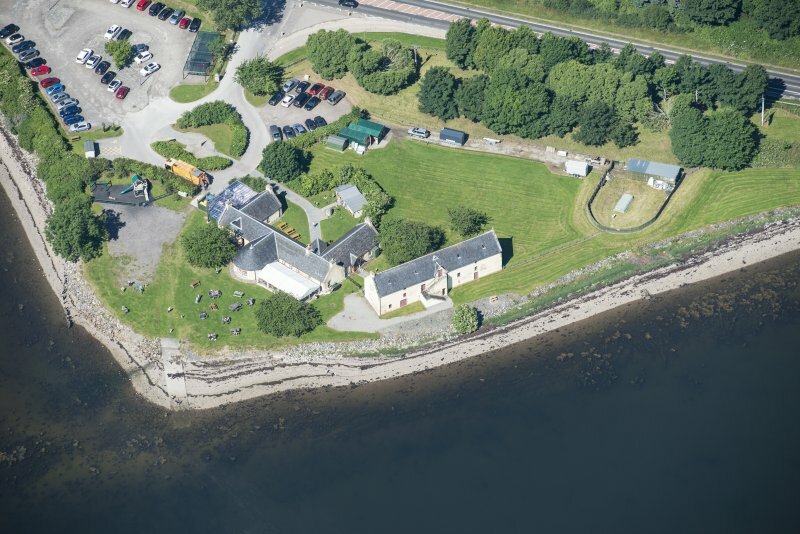 By the early 19th century most rents were paid in money, but the Rent House remained in use as a storehouse for goods moving in or out of the estate by sea well into the 20th century. 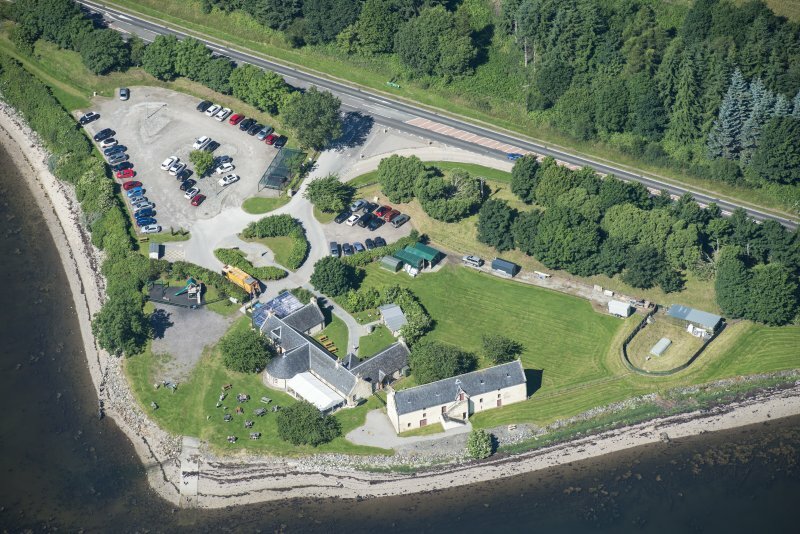 Next to the Rent House is a low cottage, now a restaurant, where the ferryman used to live. 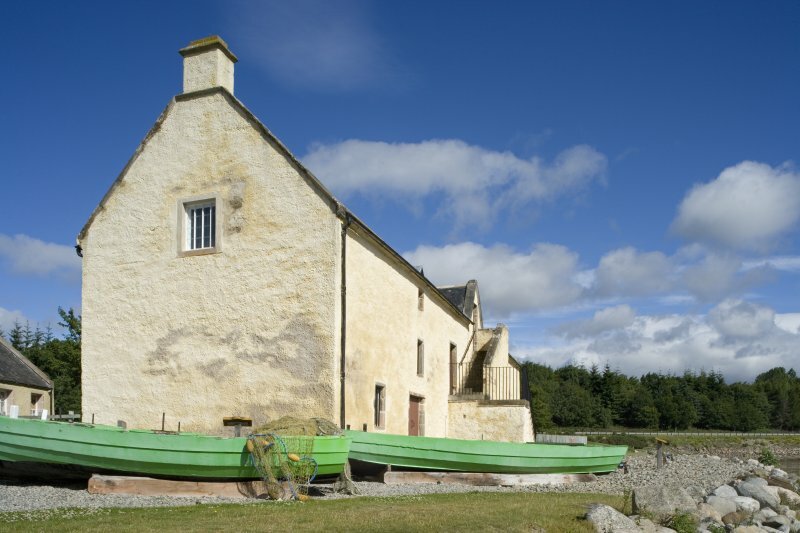 The Rent House is a large rectangular building of two floors and an attic, constructed of harled rubble masonry bonded with mortar under a slate roof. One gable has a chimney, the other a decorative ball finial. Dressed stonework frames the doors and windows. There were three original ground-floor entrances on the seaward side. 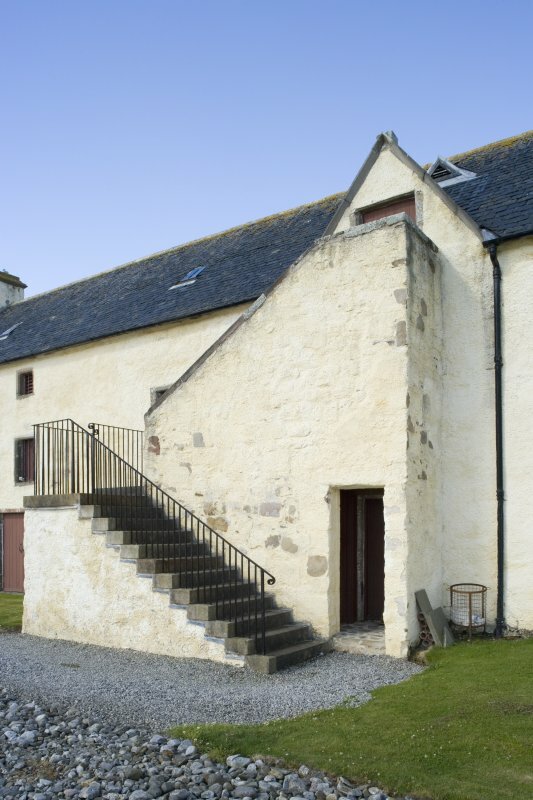 A massive external stair was added early on, giving access to doors to the two upper floors. These doors may formerly have been served by hoists, or an outside wooden stair. The windows are noticeably small, those on the ground floor mere slits to provide the necessary ventilation for the grain. They were provided with both shutters (recently replaced on the old pattern) and bars. Some doors and windows have been altered or replaced in the course of time. Inside, most of the ground floor was one open room, with the wooden floor of the room above supported on a central row of wooden pillars, and the attic floor above similarly supported. Downstairs there may have been a small room at the west end, next to the chimney, for the man in charge of the store. At the east end two small rooms were partitioned off before 1817 to serve as lockup stores. One has had wooden meal bins built round its walls. 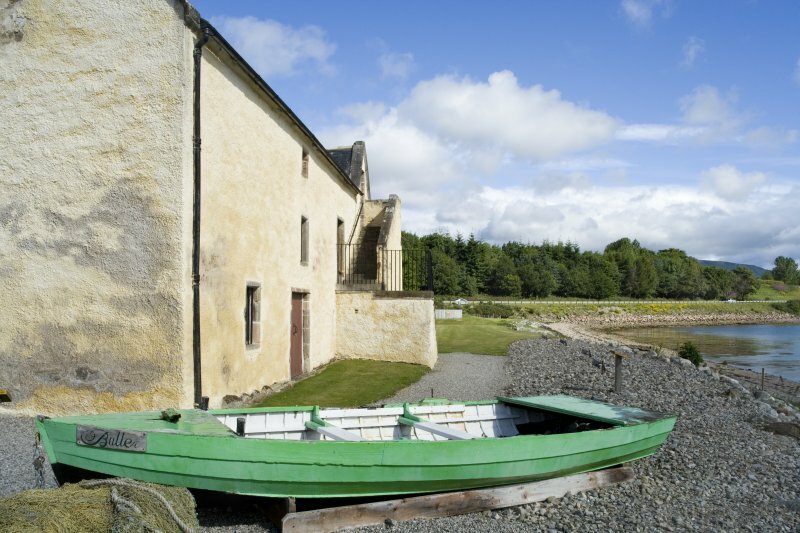 On the wooden panelling of the partitions, and on some beams upstairs, are a series of scribbled notes of amounts of grain; one mentions a schooner loading oats in 1817, another the schooner Euphemia of Berwick (registered at Berwick 1849) and there are later references to steamships. 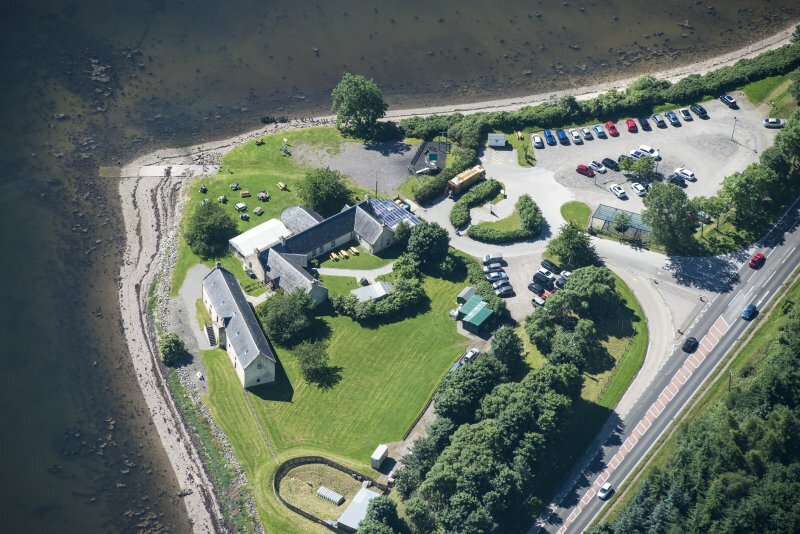 The Rent House was the scene of a meal riot in 1796 when the townspeople of Dingwall marched on it at a time of food shortage to prevent the export of grain they believed to be held there, but they eventually dispersed without incident. It is hoped to open the Rent House to the public some time in the future.